To Ajit P. Yoganathan a malfunctioning heart is also an engineering problem. To a select group of surgeons, he is the man they visit before they enter the operating theatre. They are looking to him to understand what to expect and to help them make the smartest possible choice. 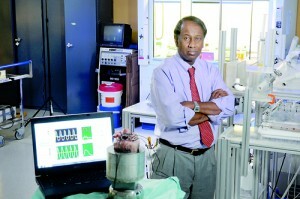 Currently the Regents’ Professor in the Wallace H. Coulter Department of Biomedical Engineering as well as the Director of the Centre for Innovative Cardiovascular Technologies at the Georgia Institute of Technology Ajit is among the world’s leading experts in cardiovascular fluid mechanics – the study of how blood flows through the heart. A surgical planning tool – SURGEM – and the analysis his team provides is revolutionising paediatric surgery in hospitals like Children’s Hospital of Philadelphia and Children’s Hospital of Atlanta but Ajit’s advice is also sought after by manufacturers of medical devices. As the inventor of the surgical technique known as the Y-graft, his decades of research have made him the go to man for American manufacturers of replacement heart valves. The value of his work is well recognized – in 2013 he was one of the recipients of the ‘The Emory 1%’ award in recognition of a $2.5 million National Institutes of Health (NIH) grant on aortic valve mechanobiology, one of many honours he has received over the course of his career. A year before, when introducing him as the winner of the 2012 Pritzker Distinguished Lecture Award, BME chairman Dr. Richard Waugh noted that Ajit had been instrumental in founding the department he now headed, adding “his 40 year career has been translational in nature, applying basic engineering science to develop meaningful human health outcomes, particularly in the realm of cardiovascular engineering.” In interviews, colleagues such as Professor Don Giddens, the former dean of the College of Engineering have described his focus on ‘getting things to patients, and direct interaction with the clinical environment’ as ‘path breaking.’ Ajit is clearly unusual in this, specifically in the speed at which his research finds application in the real world, impacting hospital processes and individual patient’s lives – but that’s what appeals to him in the first place. Over a Skype interview from his home outside Atlanta, Ajit tells The Sunday Times that as a young student in the 1970s he had initially intended to study air pollution. When he heard a lecturer on cardiovascular fluid dynamics talk about the emerging field, he was so intrigued he decided to pursue that instead. “I didn’t even know that engineers were looking at things like that. It was the early days when engineering was being applied to medicine,” he says. Growing up in Colombo, where he attended Royal College, Ajit knew more about medicine than your average 10 year old. His father was a doctor with a private practice who would often see patients at home, while his mother was a professor of pathology at the University of Colombo. On school holidays, Ajit’s mother would often take him with her to class where he’d sit in on her lectures. When Ajit began studying cardiovascular fluid dynamics, he was one of a small coterie of specialists. Over the course of his career, he would see the field expand as the value of this research became obvious. Now, Ajit describes his work in layman’s terms as “looking at the way blood flows in the heart.” Though the surgeons he’s working with will still have to think on their feet, in theory Ajit is ensuring there are no unpleasant surprises waiting on the operating table. Using MRI tomography to create a 3D image of the patient’s heart, ‘virtual surgery software’ developed at Georgia Tech allows a doctor to input several different approaches to a cardiovascular procedure. 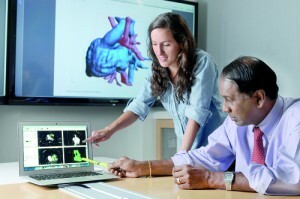 In Ajit’s lab, researchers evaluate each option, using complex formulas to chart the flow of blood through the heart and to the lungs in each scenario. Surgeons are then sent images for each surgical scenario from which they select the one that best matches the needs of individual patients. Having considered anywhere between 4 – 6 options, doctors are sometimes surprised by which one works best, making these insights invaluable, particularly when working with the tiniest, most delicate of young hearts. In the last decade or two, the field has moved forward in leaps and bounds as technology has allowed us to see deeper and comprehend the issues clearly. “We can now look inside someone’s heart without cutting them open. We can see how the blood is flowing,” says Ajit pointing to technologies like ultrasound, high speed x-ray and magnetic resonance imaging as having really improved our understanding. In turn, these insights inspire new techniques and devices. In his lab, Ajit’s team studies the performance of heart valves and how these valves are affected by disease. Investigators want to explore how various surgical corrections work to restore the valve’s function, why surgical repairs have a limited lifespan and what a new generation of artificial valves could do better. In some cases, leaps forward happen almost serendipitously. The Y-graft came about when Ajit was studying single ventricle cases. After a surgery, he saw that blood from the upper body and lower body entered the lungs, colliding and mixing. Inevitably, the smooth flow of blood was interrupted, forcing the heart to work harder to pump the blood through the lungs. Ajit’s response to the problem was to suggest grafting the veins into a Y-shape, instead of a straight graft. Computer models confirmed his theory, showing that this graft reduced stress on the heart, in turn reducing the risk of heart failure. Published in The Sunday Times, Sri Lanka on May 18, 2014. Words by Smriti Daniel. Pictures courtesy Ajit Yoganathan.